Feasibility of Transvaginal Peritoneoscopy Using Novel Articulated Stereo-laparoscope Robot. Objectives: Natural orifice translumenal endoscopic surgery (NOTES) promises to decrease patient morbidity and hospital length of stay by eliminating incisions in the anterior abdominal wall. The clinical introduction of this technique has in part been hindered by the relative complexity of operating the conventional flexible endoscope within the peritoneal cavity. 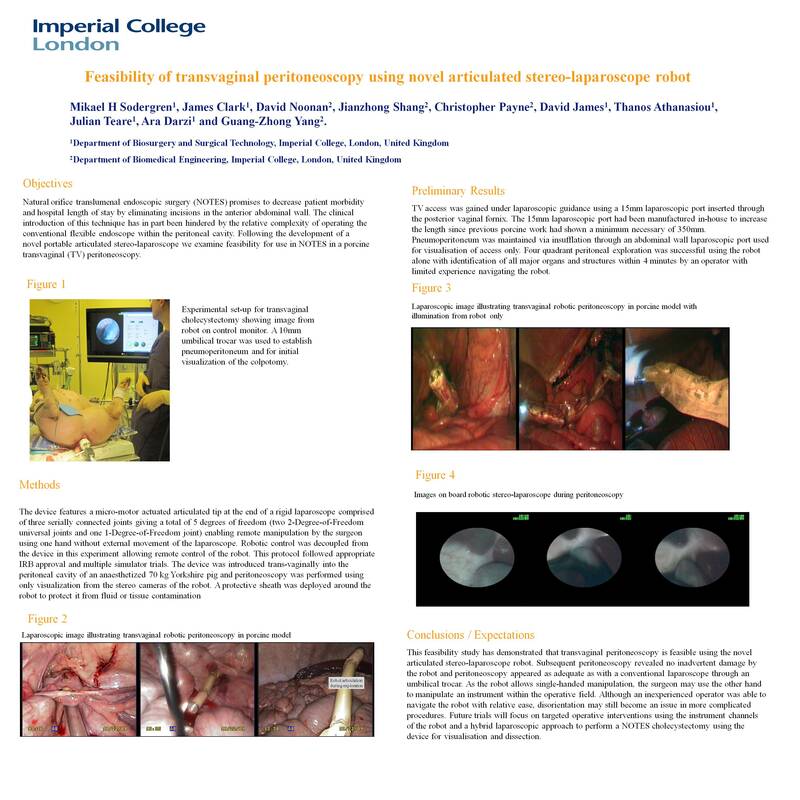 Following the development of a novel portable articulated stereo-laparoscope we examine feasibility for use in NOTES in a porcine transvaginal (TV) peritoneoscopy. Methods: The device features a micro-motor actuated articulated tip at the end of a rigid laparoscope comprised of three serially connected joints giving a total of 5 degrees of freedom (two 2-Degree-of-Freedom universal joints and one 1-Degree-of-Freedom joint) enabling remote manipulation by the surgeon using one hand without external movement of the laparoscope. Robotic control was decoupled from the device in this experiment allowing remote control of the robot. This protocol followed appropriate IRB approval and multiple simulator trials. The device was introduced trans-vaginally into the peritoneal cavity of an anaesthetized 70 kg Yorkshire pig and peritoneoscopy was performed using only visualization from the stereo cameras of the robot. A protective sheath was deployed around the robot to protect it from fluid or tissue contamination (figure 1). Preliminary results: TV access was gained under laparoscopic guidance using a 15mm laparoscopic port inserted through the posterior vaginal fornix. Pneumoperitoneum was maintained via insufflation through an abdominal wall laparoscopic port used for visualisation of access only. Four quadrant peritoneal exploration was successful using the robot alone with identification of all major organs and structures within 4 minutes by an operator with limited experience navigating the robot. Conclusion / Expectations: As the robot allows single-handed manipulation, the surgeon may use the other hand to manipulate an instrument within the operative field. Although an inexperienced operator was able to navigate the robot with relative easy, disorientation may still become an issue in more complicated procedures. Future trials will focus on targeted operative interventions using the instrument channels of the robot and a hybrid laparoscopic approach to perform a NOTES cholecystectomy using the device for visualisation and dissection.